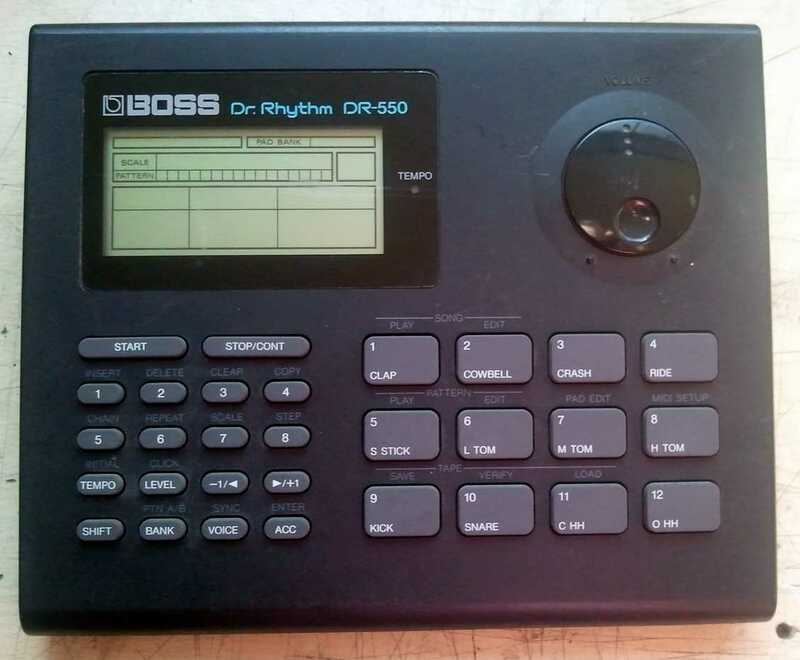 Boss DR-110 n 1980, Roland introduced their first simple and affordable drum machine to bear the BOSS Dr. 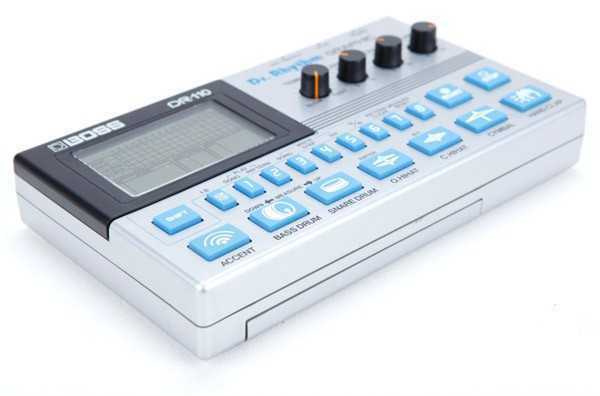 Rhythm brand (the DR-55), offering four sounds, an Accent and a limited number of programmable patterns. It was followed by the Dr. 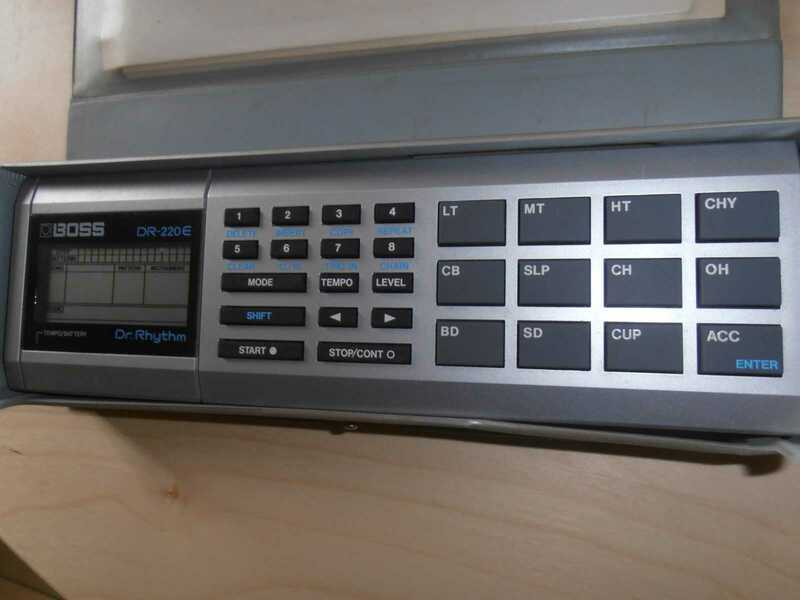 Rhythm Graphic (DR-110) in 1983, which offers a wider selection of sounds, preset patterns, an increased number of programmable patterns and the ability to chain patterns together to form songs. The simple step programming of the first Dr. Rhythm, with alternating button presses for notes and rests, is augmented by an LCD with a grid showing the individual notes in the current pattern. In addition to step programming there is also a “tap write” programming mode, albeit without a metronome click for timekeeping. The sounds are Kick, Snare, Closed Hi-Hat, Open Hi-Hat, Cymbal and Clap. The sounds are totally analog, and sound crisp and punchy, thanks to tone generation circuitry that is more sophisticated than the Roland TR-606 Drumatix. A balance knob alters the level of the Kick, Snare and Clap relative to the other sounds, while an accent knob controls the amount of emphasis applied to accented steps. There is also a volume knob, which controls the overall level of both the main and headphone outputs. The main output is mono, but has an unusual feature whereby plugging in a suitable wired lead with a stereo jack plug allows for the feeding in of another signal to be mixed with the drum sounds. Another socket provides for a trigger signal, emitting a pulse for every accented step in a pattern. The patterns are organized into four banks of eight patterns each. Banks C and D are the presets, while banks A and B are programmable. Each pattern can be switched between 12 or 16 steps, for a 3/4 or 4/4 time signature. Two songs can be programmed, each containing a maximum of 128 bars. At the time of writing, the Dr. 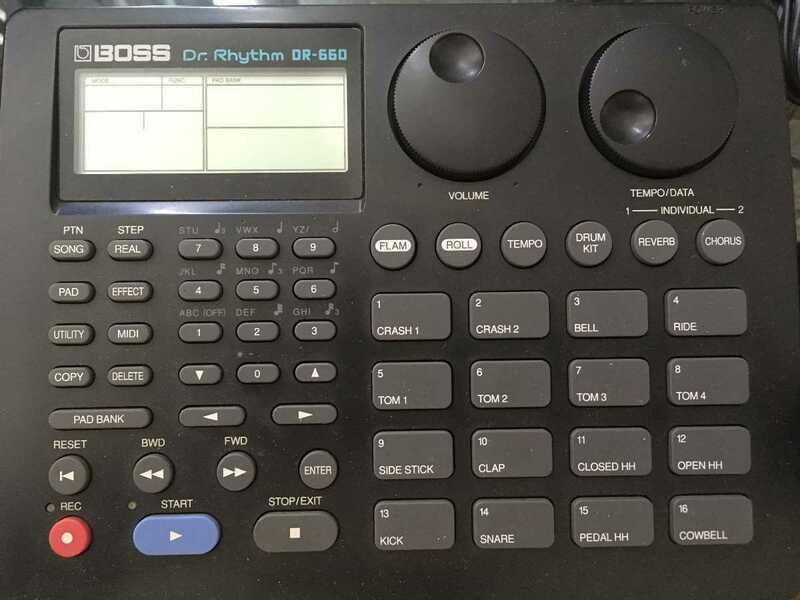 Rhythm Graphic is relatively affordable compared to similar machines such as the Roland TR-606 Drumatix, and are usually found in good condition thanks to the padded carry case that they came with. On the downside, there are no outputs or tone controls for the individual sounds, but a number of well documented modifications can be found on the Internet that add these features.